OR YEHUDA, Israel (Reuters) – Darting between the goal posts with his striking white hair, 73-year-old Israeli Isaak Hayik set a new world record on Friday as the oldest person to play in a professional soccer match. 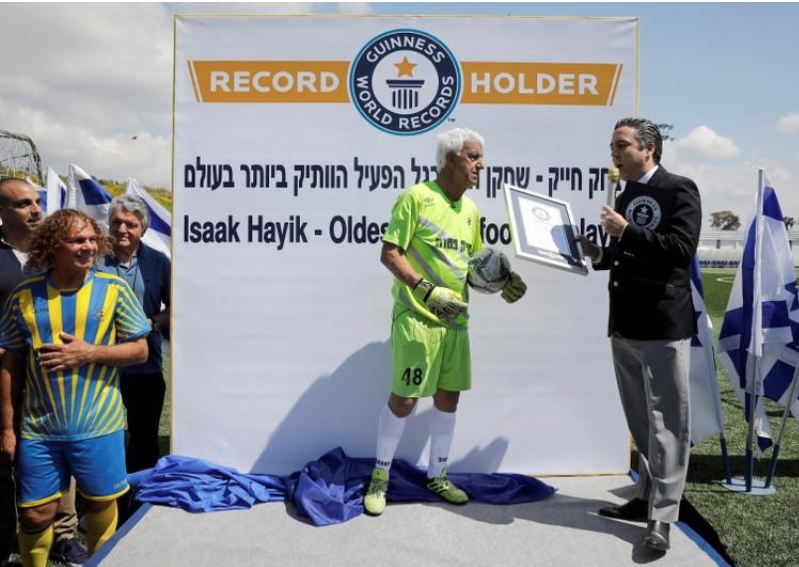 Hayik, who celebrates his 74th birthday next week, broke the record after playing as a goalkeeper in an afternoon game with Israel’s Ironi Or Yehuda soccer club. The Iraqi-born keeper was officially recognized in an award ceremony attended by representatives from the Guinness World Record organization. “I’m ready for another game,” said Hayik, who made some good saves in the team’s 5-1 defeat to Maccabi Ramat Gan. “This is not only a source of pride for me but also to Israeli sports in general,” added Hayik, who moved to Israel when he was four years old. The previous record was held by Robert Carmona of Uruguay, who in 2015 played a professional match with Uruguay’s Pan de Azucar at the age of 53, an official adjudicator for Guinness World Records said. Hayik’s family were among the tens of thousands of Iraqi Jews who fled to Israel in the mid-20th century, following the country’s creation in 1948. His children spoke of their pride in their father’s achievement. One of his sons said he and his father used to play together.